UPDATE 6-4-08: Riding a wave of superdelegate endorsements and delegates won in the final two primaries, Obama reached 2,118 delegates last night, June 3, and clinched the nomination in a historic victory. Working together, we made a difference in this race. We helped voters from around the country generate an estimated several thousand e-mails and phone calls to superdelegates, and gathered thousands more signatures on petitions in seven states including North Carolina, where we first organized. Thanks to our coalition members and supporters, plus everyone who visited our site and used the tools here to e-mail, call, or sign a petition to superdelegates. We let our party leaders know their constituents wanted Obama to be the Democratic presidential nominee in 2008, and they listened! We are contacting local superdelegates, and gathering signatures from voters in our communities asking superdelegates to back Obama. Our focus is on states and districts where Obama won the popular vote. This site contains a state-by state list of superdelegates, who is backing Obama, Clinton, or undecided, and how to reach them. For instructions on how to use the list, CLICK HERE. NOTE: As of June 4, when Hillary announced her intention to suspend her campaign, we stopped updating this list and removed most contact info. If superdelegates hold the key to the 2008 Democratic nomination, we the voters can take action to help determine the outcome. UPDATE 6-2-08: Two days after the May 31 compromise to seat the MI & FL delegations, there is hope that this endless nomination fight is wrapping up. House Democratic Majority Whip Jim Clyburn (D-S.C.) has leaked his pending Obama endorsement, MSNBC is reporting 34 House members will announce for Obama tomorrow, and CNN says most of the remaining undecided 17 Democratic Senators will back Obama later this week. Hillary will appear at a Tuesday night event in New York that many anticipate will be her concession speech. Will it all be over tomorrow night? We'll see. UPDATE 5-29-08: Our Massachusetts supporters have launched an online petition to the MA superdelegates. If you want to sponsor an online superdelegate petition in your state, contact us. UPDATE 5-15-08: Now that Obama has won North Carolina's May 6 primary by a large, 14-point margin, we have launched an online petition asking all N.C. superdelegates to unite behind his candidacy. N.C. voters can sign the petition HERE. Virginia voters can sign the online petition to VA superdelegates, started by VA state Democratic officials in April. UPDATE 5-13-08: A costumed team of SuperVoters for Obama today delivered petitions from 2,000 North Carolina voters to Gov. Easley, asking him to support Obama in his role as a Democratic superdelegate. Our costumes may have been a little silly, but our message to Gov. Easley and the other N.C. superdelegates was serious. On May 6, North Carolina voted for Obama by a large margin, and now it's the superdelegates' turn to act. UPDATE 5-9-08: On the heels of Obama's May 6 victory in North Carolina and Indiana near-win, has the logjam broken? News organizations including ABC News and Politico reported that Obama picked up nine SD's today and has pulled ahead of Clinton in the superdelegate race, overtaking her long-time advantage. Yes We Can! UPDATE 4-16-08: Voters for Obama wants to thank both Democratic Reps. David Price and Mel Watt for their endorsements today. We're glad they listened to North Carolina voters, 2,000 of whom have signed petitions in the last two months asking N.C. superdelegates to back Obama, including more than 500 in Rep. Price's district. Q: I just found your site. What should I do first? A: Start by calling or e-mailing undecided superdelegates in your state and asking them to support Obama. Visit our Get Involved page for a complete rundown of what else you can do to help. Q: Are you part of the Obama campaign? A: No. 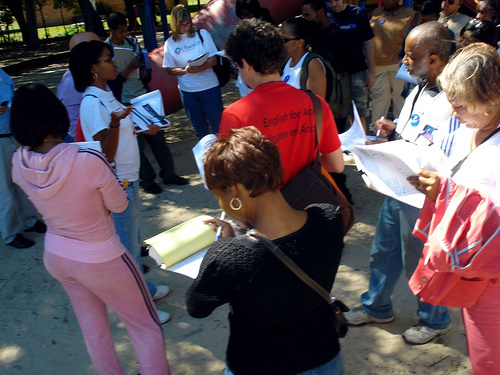 Voters for Obama is a volunteer organizaton, and is not affiliated with Obama for America. We are what the FEC calls an “independent expenditure” group. Our website is not authorized by any candidate or candidate's committee. Q: Where can I leave comments? A: You can comment on posts featured on the main page (or anywhere else on the site - people also leave comments on individual states' pages), or e-mail us your thoughts, photos, or stories to votersforobama-at-gmail.com. If you start a petition drive in your area, or want to share your experience contacting local superdelegates, please let us know. Q: Haven’t these superdelegates been bothered enough already? Are they going to resent hearing from ordinary voters? A: We are focusing our efforts on superdelegates who are also elected officials (or state party chairs) and responsive to the citizens who vote for them, especially in states and districts where Obama won the popular vote. Following a news story about his previous indecision, Mallory said he heard from many of his local citizens. "[I] got lots of calls and e-mails, mostly telling me to support Obama," he said. "I got three or four calls in support of Clinton, but it was very lopsided." Q: Hillary’s campaign has a website containing personal e-mail addresses and home phone #’s for all the superdelegates who have endorsed her. Why can’t I find that info here? A: Our citizen lobbying is directed towards undecided superdelegates, not ones who have already endorsed Obama or Clinton (with a few exceptions). Only office phone numbers, e-mails and contact info is listed on this site, and all petitions should be addressed to superdelegates' office addresses. Like New Mexico Gov. Bill Richardson noted before he endorsed Obama on March 21, it’s better to use strategic tactics instead of trying to carpetbomb the superdelegates. Q: I clicked on my state and saw your list of superdelegates. But how do I tell which ones are still undecided? A: On each state's page, all the supers that have "Obama" following their names (whether or not it includes a link to a news story about the date when they endorsed) have announced for Obama. They are also highlighted in blue. The ones with "Clinton" following their names and highlighted in orange have come out for Clinton. The remaining undecided superdelegates do not have "Obama" or "Clinton" following their names, and their names are not highlighted. Q: Why is the date on your home page "Thursday, August 28, 2008"? A: We're hosting our website using Blogger, so all the site's "pages" are actually blog posts, and they all have dates. The site's main pages are dated during the week in August when the Democratic National Convention will take place (Aug 25-28). Our home page is the chronologically last post on the blog, so it's the first thing people see. The post is dated Thursday, August 28 because that's the last day of the convention, and the eventual nominee's acceptance speech is scheduled for that evening. It's up to all of us working together to make sure Barack is the one giving that speech.